NEVERLAND chronicles the final days of Peter Pan's utopia. When Wendy, an Avondale teenager, becomes the newest addition to The Lost, Peter's band of runaway teens from different decades, she discovers an underground kingdom ready to shatter. Struggling to find it's future under the direction of confused leadership, bloody past practices, and centuries long wars over legacy, the inhabitants of Neverland can no longer hide from what they've become. The journey from childhood to adulthood has never been so treacherous than in this "Peter Pan" in the era of Trump's America. "...Though it takes a while to get going, this new take, devised by the Prop Thtr ensemble and directed by Olivia Lilley, managed to win this skeptic over by turning a well-worn story on its head and giving it a ripped-from-the-headlines urgency. Pan is an arrogant man-child who punishes anyone who dares to question his motives, Wendy is a manipulative teenage delinquent, and Hook is a heartbroken and bitter woman who's just looking for a little love and understanding." "...“Neverland” definitely asks a lot of its audience, but also rewards the viewers with a delightful cast of characters and theatrical elements. 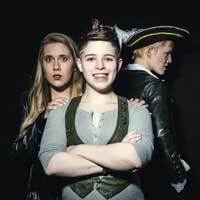 If you want to see Peter Pan from a new angle, this is the show for you." "...In this production, we're treated to another of Prop Thtr's typically inventive productions. In addition to offering a fresh examination of great literature, this is a company that, as its name implies, makes strong, creative choices involving the use of properties. It also brilliantly incorporates sound and light in a magical, memorable way that stands out from every other theatre company. Yes, the story is a little confusing, and its plot does converge and get tangled; but the overall experience for the theatergoer is strong, thrilling and thought-provoking."